Much has already been said about the publication of the latest round of the Government Expenditure and Revenue Scotland report or GERS (http://www.gov.scot/Resource/0047/00472877.pdf). Much rammying done over what these figures mean for an independent Scotland. Answer: Not much. They tell us nothing about future policy direction. GERS isn’t a prediction of different circumstances, merely a snapshot of how current policy is affecting us. More rammies have broken out over whether Scotland is or is not “subsidised” by money from the rest of the UK. Answer: This year and last, probably. But it’s yet to make up for the decades of cash flowing the other way to the tune of around £220 billion over the past 35 years. Little is said during this about the state of the UK’s finances to which we are compared. As a percentage of revenue, the UK deficit is currently worse than that of Greece at 15.6% versus 10.4% respectively! Even less is said about how balanced Scotland’s economy is compared to the UK’s. If we are to be bound by (largely) the same economic rules and austerity agenda then we need to know if it is “working” for Scotland as well as for the UK as a whole. 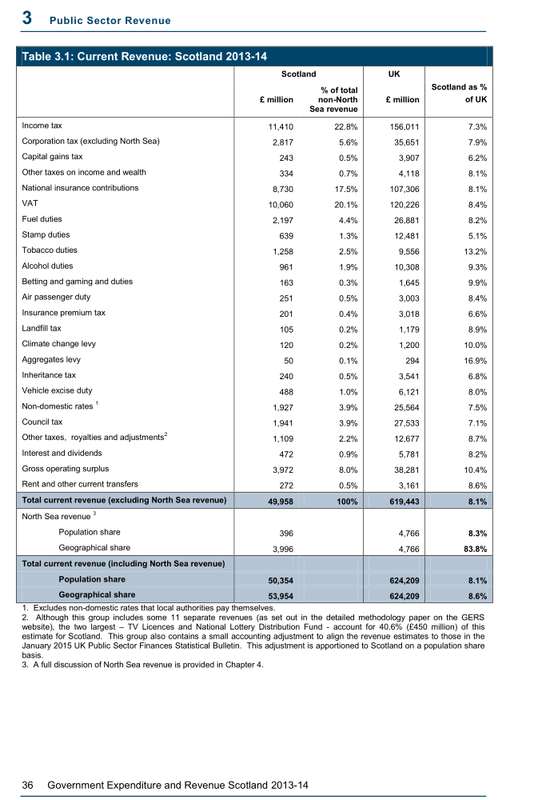 Here is the table from the report breaking down the tax revenue from various sources. Scotland, by population, makes up 8.1% of the UK total. We should, all things being equal, contribute 8.1% of each of those different tax sources. Several disparities stand out to me. The largest one is income tax. There is a £1.2 billion shortfall in our income tax receipts. This is despite Scotland’s higher employment rate. In essence, Scots are taking on lower paid jobs thus paying less in tax. Correcting that shortfall is the equivalent of taking every single worker in Scotland, part time and full time, currently earning less than the Living Wage and paying them a £25,000 salary instead. The lack of decent employment in Scotland is having a devastating impact on our nation’s finances and our ability to sustain public services. Incidentally, increasing employee pay would also raise the amount of National Insurance paid by several billions of pounds. Ruth Davidson suggested fixing the deficit by raising the income tax rate, I simply say have more people earn more money and use that to pay more tax. 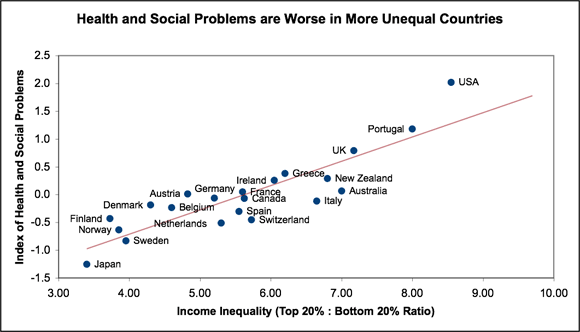 Whilst we’re looking at income, it’s worth looking at the other end of the spectrum. The large corporations touted as the “job creators” in this economic climate are largely based in London and the South East and the very rich pay a greater fraction of their taxes via Capital Gains and other wealth related taxes. Again, here, we see a shortfall in the amount paid compared to rUK removes over half a billion from Scotland’s accounts. Another £660 million are “missing” from our accounts due to shortfalls in both council tax and stamp duties. Policies designed to further inflate the London housing bubble simply don’t fit in a nation where the house prices are consistently comparatively lower. But where does Scotland “over contribute” to the national finances? Tobacco, alcohol and gambling duties all contribute far in excess of our UK “share”. Some £640 million per year is collected off the back of spending on these items. Time and time again, studies have shown that a population ground down by stress and inequality turn to vice and addiction to ease the pressure (http://www.gcph.co.uk/assets/0000/1080/GLA147851_Hypothesis_Report__2_.pdf) and that income inequality in particular is the single strongest correlator with a nation’s overall wellbeing. If the economic policies of Westminster are designed to improve the lot of the top 10% (who have seen their share of national wealth increase from 20% to 35% of the total within my lifetime) then here is direct evidence that this strategy is most certainly not designed to help Scotland. So why is no-one talking about all of this? Why do we hear nothing more than the same old back-and-forth mud slinging? There are plenty of journalists and politicians who have spent hours poring over the same data presented here. They must have the ability to spot the same patterns as anyone else can. Is it possible that it’s simply easier to complain about a problem than to identify the causes of it, much less actually suggest a solution?